Gunwharf Gate, the district bounded by Warblington Street, Gunwharf Road and St George's Road, often seems to be ignored when considered in the context of Old Portsmouth, no doubt because it is an entirely new development. 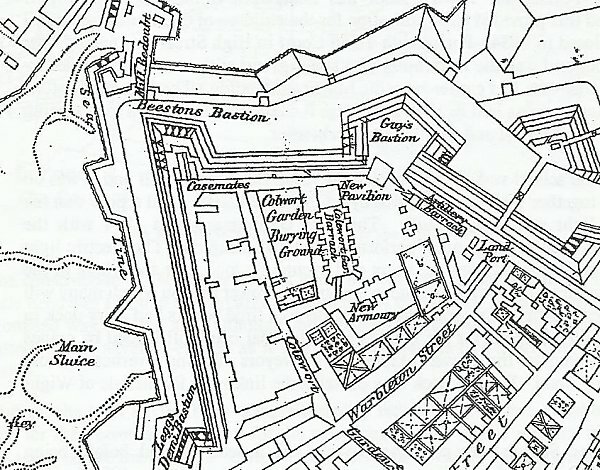 However it is an integral part of the historic town and was contained within the fortifications before they were demolished at the end of the 19th century. It is the one area which has seen more change than any other being almost completely cleared and redeveloped on two separate occasions. Until the early part of the 20th century there was a number of notable buildings on the site including the Colewort Barracks constructed originally in 1694 as a hospital for the garrison before becoming a barracks. The name Colewort derives from a type of cabbage which was purported to have been grown in this area: certainly the early maps indicate that, in the 16th century, fields occupied the land that has now become Gunwharf Gate and could well have been used for growing vegetables. In the 17th and 18th centuries, the number of poor people in the town became a problem and in 1725 a Poorhouse was built on a site at the north east end of Warblington Street. The land is now occupied by part of the electricity substation buildings. Highbury Street was originally known as Colewort Garden Street and extended through to Gunwharf Road (then Prospect Row). In 1838/39 St Mary's Church was built on vacant land at the north end of this street adjacent to Colewort Barracks and near to the site of a mediaeval chapel of Our Lady of Clozse. St Mary's Church served as a chapel of ease for the increasing population of this part of the town but was eventually demolished in 1921. The site, including the graveyard, was designated to be preserved as open space in perpetuity! Colewort Garden Street had become St Mary's Street during this time before eventually being renamed 'Highbury Street'. Not far from St Mary's Church, John Pounds, the cobbler who set up the first ragged school, had his workshop and house. A replica of this building has, of course, now been constructed behind the John Pounds Memorial Church in High Street. In 1878, Portsmouth Town School was established fronting onto Gunwharf Road and this provided basic education for the children of Old Portsmouth until it was closed in 1934. Portsmouth Town Court in High Street was named after the school and was the inspiration of a small group of the ex-pupils headed by Jim Butcher who had earlier been the Mayor of Reading. The foundation stone in the entrance was laid in 1976 by George P.Clark who had been a long serving teacher at the school and was the last headmaster. Next to the school was the site of the old "Blue Bell" music hall and it was on this site together with land occupied by a number of houses of 'ill repute' that the electric light station was built. This was commissioned in 1894 with the Mayoress, Mrs A.L. Emanuel, performing the switching on. The electric light station was extended over the years and eventually took over the whole of the land now forming Gunwharf Gate to become the Power Station which many will remember. 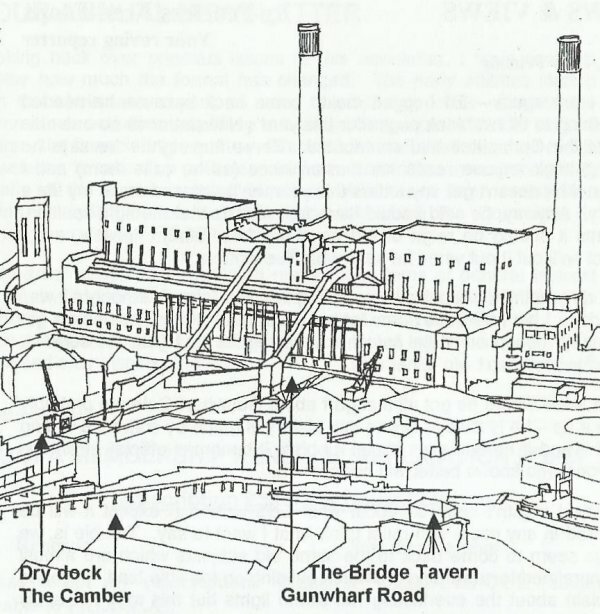 Initially the generators relied on coal fired boilers and a dry dock in the Camber was used for the colliers with the coal being off-loaded by cranes and delivered to the Power Station by conveyors running overhead across Gunwharf Road. The dry dock now contains the link-span for the Isle of Wight car ferries. The Power Station was converted to use oil instead of coal before being relegated to a stand-by station and eventually being demolished in 1983/4. This then enabled the site to be released for the Gunwharf Gate housing development to be built except for the sections where electrical installations have been retained at the top end of Warblington Street and for the Wightlink marshalling area. The construction of the Power Station buildings was carried out in times when little heed was taken of conservation. Preservation of the open space previously promised was ignored and, although John Pounds's house was dismantled and stored, it was never re-erected as it was reported that the timber structure had rotted. And so, the land having been comprehensively redeveloped on two occasions, first for the Power Station, then for the new housing, any visible remains from the years before the early 20th century have been lost. I believe that bones have been found in some gardens but, generally, evidence of previous uses will now have been disturbed or destroyed by such extensive reconstruction.